The son of the late Malian guitarist Ali Farka Touré inherited his dad’s dazzlingly fluid phrasing but clearly also digs the fiery African blues rock of bands like Tinariwen…a crossover that slays. —Rolling Stone. The son of legendary Malian guitar player Ali Farka Touré, Vieux is known for dazzling speed, dexterity and melodic intricacy on the guitar. Initially a drummer-calabash player at Mali’s Institut National des Arts, Vieux took up the guitar in 2001. 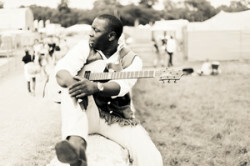 Six years later he recorded his debut, featuring Ali on two tracks (among the elder musician’s final recordings), and following his father’s tradition of West African music echoing American blues. On 2009’s critically acclaimed Fondo, Vieux branched out and explored elements of rock, Latin music, and other African influences as the young musician began moving out of his father’s shadow. By 2011, the year he released The Secret (featuring Derek Trucks and South African-born Dave Matthews) Vieux had firmly established himself as one of the world’s guitar virtuosos with a distinct style that pays homage to the past while leaning toward the future. 2012’s The Tel Aviv Session (Cumbancha) was the first of a pair of collaborations with Israeli superstar Idan Raichel, dubbed ‘The Touré-Raichel Collective.’ Widely considered a masterpiece and one of the best collaborative albums in the history of international music, it often draws comparisons to Ali Farka Touré’s and Ry Cooder’s legendary Talking Timbuktu album. The Collective is a powerful testimonial to the power of art and fraternity to transcend vast cultural and political divides. Vieux’s latest is another unexpected, genre-bending collaboration, this time with New York-based singer Julia Easterlin, aptly titled Touristes. Easterlin will join Vieux’s band at Tulsa Roots Rocks the Green. Big thanks to the Cherokee Nation for sp0nsoring the day’s activities.